Night diving off Kona, Hawaii, is renowned for encounters with manta rays! If you head to the right spot during October, you can expect encounters with some of the biggest animals in the sea (fancy swimming with blue whales?!) October is the first month that various species of whales, such as humpbacks and even the enormous blue whale, can be spotted in Baja, Mexico. Tradewinds drop in the Seychelles in October, and the great water-conditions and pleasant weather make this a perfect time to visit. Diving off Hawaii’s Big Island is fantastic onboard the Kona Aggressor II and is one of the few places you can dive with manta rays in the dark. Australia might be known for its Great Barrier Reef, but from late July to early November visiting Rowley Shoals in Western Australia is an absolute must for any dive fanatic. October means the start of whale watching season in Baja, Mexico! Not just a single species of whale either. Minke, humpback, pilot, orcas and even blue whales all make an appearance in Mexico from October through to April. Being in the water with these animals is a humbling and exhilarating experience, and swimming beside these enormous yet gentle creatures is one you will truly never forget. A whopping 20% of Hawaii’s marine life is found nowhere else in the world, and the Big Island of Hawaii provides habitat to a huge amount of this marine life. The Kona Aggressor II offers weeklong dive trips off Kona, which is located on the Big Island of Hawaii. The Big Islands volcanic underwater topography makes a striking backdrop for the unlimited amount of dives that are on offer during a Kona Aggressor II liveaboard. Huge craters, bommies, and lava tubes will keep you enthralled dive after dive, as will the marine life. Kona is one of the few places where you can dive with manta rays at night. Manta rays are often referred to as the ballerinas of the sea, and as you watch them dance around you in your torch beam as they feed on plankton you’ll have to pinch yourself to make sure you’re not dreaming. 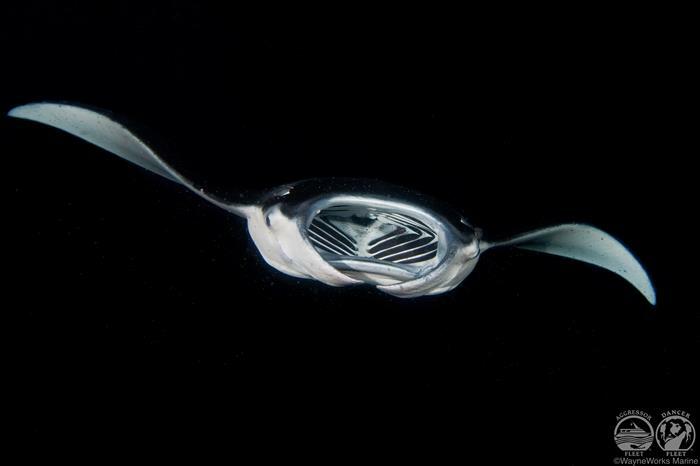 On one trip, the team onboard the Kona Aggressor II reported seeing 46 mantas on a single night dive! Kona is also home to many species of endemic butterflyfish, which make excellent subjects for underwater photography enthusiasts. Rowley Shoals, which is located 300 kilometers off Broome, Western Australia, is home to marine biodiversity that rivals that of the Great Barrier Reef. Rowley Shoals has one of the shortest dive seasons, beginning at the very end of July and finishing early November. Rowley Shoals is essentially three coral atolls, which are home to hundreds of species of fish and marine life. The coral here is abundant and thriving. Sites such as ‘Jimmy Goes To China’, a 40-metre wall covered with enormous gorgonian fans and black corals and ‘Tiger Alley’ (where it’s not uncommon to see numerous shark species) will delight and thrill divers. The Seychelles Islands weather pattern is governed between two opposing trade winds. In April and October, these winds drop resulting in wonderful conditions both above and below the water. The warm air temperature and lack of wind, combined with the warmer water temperatures and excellent visibility mean October is one of the best months to visit the Seychelles. 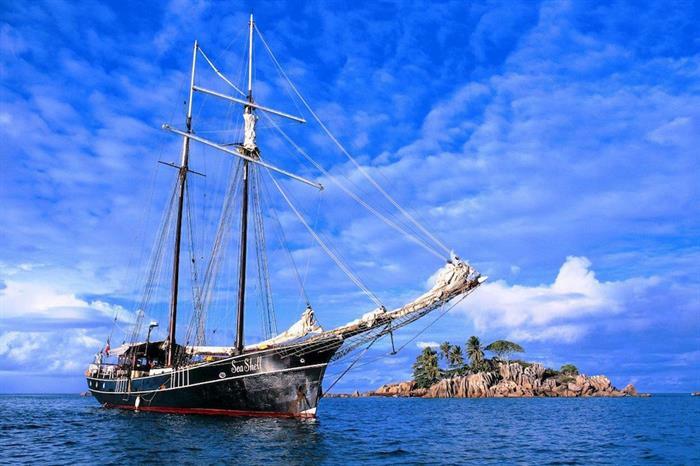 Island hopping onboard a liveaboard is the best way to see the Seychelles. Some liveaboards, such as the Sea Shell, require no dive certification at all and combine snorkeling, diving, and site-seeing all in one trip. You’ll visit uninhabited islands, beautiful beaches where you can snorkel right offshore and of course dive with the fantastic marine life that inhabits the area. From June to December whale sharks visit the Seychelles, so along with perfect weather during October, you may have the chance to swim with the biggest fish in the sea.